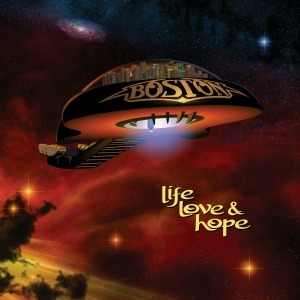 "Life, Love & Hope" is the eagerly awaited new album from Boston. It's been a long time coming - their last album, "Corporate America" was released in 2002. Worryingly it's described as "ten years in the making". Why worryingly? Well the last time an eagerly awaited album spent a decade being written/recorded was Guns'n'Roses "Chinese democracy" album, and that turned out to be a massive disappointement. So will "Life, love & hope" suffer the same fate or will it live up to expectations? Sadly, from listening to the album I have to say it desn't live up to expectations. That's not to say it's a bad album - it certainly isn't but it's more that with albums as good as the first few Boston albums to be compared against it just doesn't stand up as well. If you'd never heard the first three Boston albums then you'd probably say this was an excellent album, but the problem is that the fans have heard those albums, so in comparison would rate this merely as "good but could be better". The trademark guitar sounds and vocals are still there, but the problem for me is that it just seems to feel slightly overproduced - it's lost that rocky edge, and I suspect that is mainly down to the amount of time spent producing the album. Like anything, if you work on something too long then it's too easy to lose perspective and focus on minor details rather than the big picture. The album gets off to a promising start with "Heaven on earth". It's got that trademark Boston sound, great vocals, and a strong chorus. Listening to this opening track I was expecting great things from the rest of the album. The second track is when you start to wonder what the hell is going on. "Didn't mean to fall in love" is a track from the last album that's just been remastered and stuck in this album. So after ten years writing a new album Tom Scholtz can't even write enough new material to fill an album and has chosen to pad it out with old tracks? That's certainly the impression you get. That impression is reinforced when you see "Someone (2.0)" and "You gave up on love (2.0)" in the track listing. The 2.0 bit should be ringing major alarm bells. Yes its two more tracks from "Corporate America" that he's re-recorded or rearranged for this album. So of the 11 tracks on this new album, there are 3 tracks from the last one padding it out - that's disappointing in any album, but in one thats taken 10 years to make then it's unforgiveable. Title track "Life, love & hope" initially sounds very good, but then you start to notice that at times it sounds incredibly similar to a track from an earlier album with just the lyrics changed, and that does tarnish the song. "Someday" is another great song with more of a classic Boston sound. Overall it's actually a very good album, but it's one that doesn't live up to the amazingly high standard set by the early Boston albums, and there's the problem - any new Boston album will be compared to those amazingly good albums. Had it been released as a Tom Scholtz solo album then it would probably get less criticism as it would be judged more on its merits and less in comparison to early Boston albums. "Life, Love & Hope" will be released on 9th December.